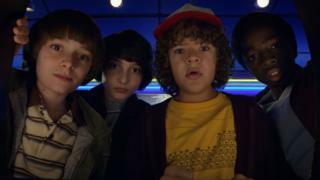 Netflix's hit show Stranger Things returned last week, bringing back its cast of monster-fighting kids.They've had a lot of attention since the show started last year - not all of it welcome.A furore has erupted after some of the young stars were sexualised in the press and social media, while others have experienced the glare of fame in everyday life.As a result, one of the cast's older stars came out to defend them, asking the media and public to respect how young they are.Shannon Purser, who plays Barb in the series, responded to one Twitter user who criticised her co-star Finn Wolfhard after the 14-year-old failed to stop for photos outside his hotel and was branded "rude" by the user. In a number of tweets, she expressed how she too gets the same treatment from over-excited fans, but is better equipped to deal with it. "I'm an adult. I can't imagine being inundated with all this attention at his age. It's intimidating," she wrote. "So, from one big sister to the world, don't you dare make young actors feel guilty or indebted to you because they couldn't say hi." Game of Thrones actress Sophie Turner also backed him up in a lengthy thread, writing: "It doesn't matter if they are an actor... they are kids first. Give them the space they need in order to grow without feeling like they owe." Wolfhard, who plays Mike, hasn't responded to the comments about him greeting fans, but did have something to say about a flirtatious message from model Ali Michael.The 27-year-old said in an Instagram post that he should "contact her in four years", when he will be 18. He said in a video published by TMZ that being propositioned in that way was "nuts" and that he found Michael's comments "gross".The model later apologised, saying in a statement to Teen Vogue that it was "never my intention (nor has it ever been) to sexualise a minor in any way shape or form". Purser's comments from the weekend sparked a wider debate about the show's young actors are portrayed.One of the show's teen stars, 13-year-old Millie Bobby Brown, has been listed as one of the reasons TV is "sexier than ever" by W magazine, among a group of much older actors including Nicole Kidman and James Franco. Brown, who plays Eleven, also had her pictures shared on social media, with users commenting on how much she had grown up and how old she looks.Mara Wilson, who starred in Matilda and began acting when she was five years old, gave her response to how young stars are treated. » Michelle Keegan: Is Our Girl too glamorous?